Combine yeast, flour, salt and sugar in a mixing bowl fitted with a dough hook on slow speed. Pour in the warm water as the mixer is going. Knead until a ball forms, tacky and elastic. Knead again by hand on a floured surface until smooth and elastic. Lightly coat dough with oil and place in a bowl. Cover and let proof for about 20 minutes. Once proofed, divide dough according to desired thickness of crust. · For three 9” thin crust pizzas, divide dough into thirds. 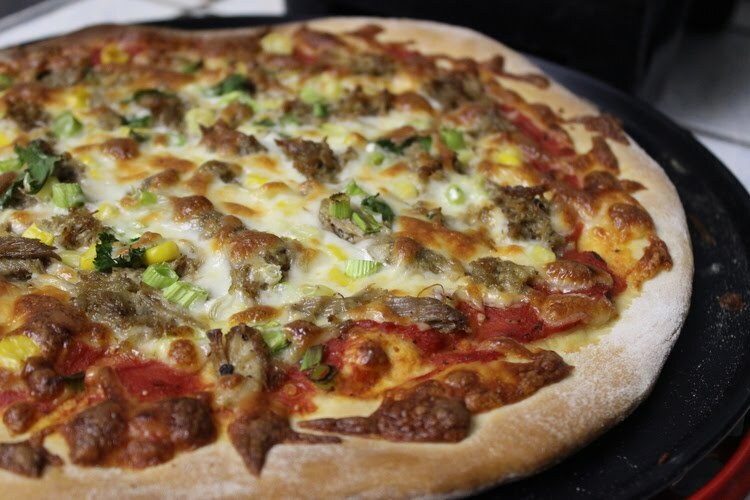 · For two 9” regular crust pizzas, divide dough in half. · For one 9” deep dish pizza, use all of the dough. Roll dough out on a floured surface and bake at 500F for about 12-15 minutes. Combine tomato paste, tomato puree, garlic and Mexican oregano in a small pot and bring to a boil. Reduce it to a simmer and let it cook while you prepare the other pizza toppings. Layer cheese, meat and other toppings as desired. Bake at 500F for about 12-15 minutes.